Amoena are a specialist manufacturer of mastectomy prostheses and related lingerie (mainly pocketed bras and swimwear). This focus has enabled them to develop some great breast forms, and many Amoena breast forms have some really unique designs based on patented technology. The worlds only temperature balancing breast form with air ventilation. Asymmetrical with an average profile in sizes 1-14. Ingenious light weight, average profile breast form that is permanently self adhesive. Sizes 1-14. Asymmetrical breast form that can be worn in bras with a slightly more plunging front, permanently self adhesive. Sizes 1-14. Asymmetrical breast form that can be worn in bras with a slightly more plunging front. Sizes 1-14. Ultra light weight triangular breast form. Sizes 1-14. Full profile contact breastform with special core to help reduce body heat. Sizes 1-10. 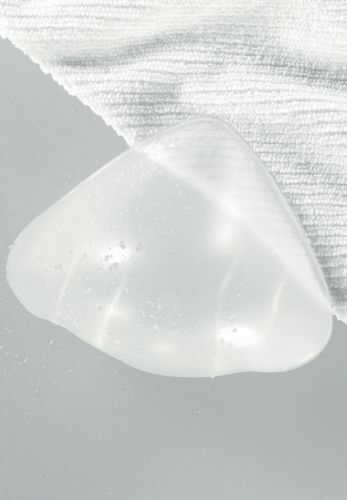 Full profile light weight contact breast form which requires no adhesive. Sizes 1-10. Light weight breast form with a natural drape. Sizes 1-14. Light weight breast form with a temperature balancing inner core, and a natural drape. Sizes 1-17. Light weight breast form with full profile, a temperature balancing inner core, and a natural drape. Sizes 0-12.